The news of the tragic deaths and disaster in our region from St Vincent to St Lucia and Dominica over the Christmas season gave us pause for thought. How prepared are we as medical professionals and disaster preparedness agencies for the potential of water-borne or other infectious diseases, how prepared are our hospitals for mass casualties? There is much talked about the battle against Non Communicable Chronic Diseases and this is laudable but while we face major health care issues, we also have to be mindful of the unpredictability of “Acts of God” from hurricanes to earthquakes and from flash flooding to any calamity which puts public health at risk. No one can “accurately” predict the next flash flood or the next rumble in the earth. Our meteorological offices give us the best possible scientific predictions that they can give us but St. Lucia‘s disaster management office NEMO recently admitted on the CMC news that their “system was down”. These things can and do happen at the most critical times. We will not put the blame at the feet of NEMO but we must ask whether we are ready to face a public health crisis in the face of possible disaster anywhere in the Caribbean. Crisis produces panic especially with the vulnerable or ill and in general. Are our Governments and hospitals equipped with rapid response services to deal with the immediacy of tragedy? Are our regional security services and disaster management preparedness offices truly ready for a major calamity? 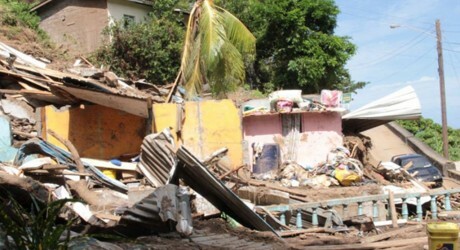 Are our most senior medical officials ready to look at keeping our populations safe from contracting illness on the proportions seen in Haiti where its citizens were hit by an earthquake so ferocious as to render hundreds of thousands homeless and also to face a cholera epidemic? Are our hospitals managed to such an extent that if faced with disaster, all systems are good and there is alternative accommodation (if possible) for hospitalized patients? We ask this in self-reflection and against the back drop of the movement of people in hospitals when Katrina hit New Orleans many years ago. We must examine where we are today! Prime Minister, the Hon. Ralph Gonzalves of St. Vincent appealed for a reduction in red tape so that urgently needed supplies reach his nation while NEMO (St. Lucia) requested hospital supplies including linen to major costly equipment that was damaged in flooding. All of us need to sit and rethink our disaster-preparedness on an individual and institutional level. We need capacity building in organizations to promote real-time readiness in the face of looming tragedy from the availability of tablets to decontaminate water to trauma care to re-housing and the prevention of the outbreak of infectious diseases. We ultimately want to save life. We are thankful that our Caribbean neighbours have answered the calls from the Prime Ministers and social agencies of the respective island countries and let us also take this opportunity to look inwardly and to get ready for something that indeed may not happen yet but very well may do so. We ask you to continue to give cheerfully to your neighbours in this desperate time of need and recovery. We wish those affected a speedy recovery from illness and any psychological trauma and that we all practice and embrace preparedness in every aspect of our lives without encouraging fear. To all a Blessed and prosperous 2014.